Note: This article was originally posted on my personal website. Head on over there to find the latest news about me, projects that I’m working on, and how you can contact me. It is difficult to keep track of everything — not only our day-to-day tasks but what truly matters in our professional lives. Life is getting increasingly faster. It’s tougher to find the time to get organized and reflect. But because of life’s increasing speed and complexity, taking on this exercise has become extremely important. For the latest episode of The Power Of Bold, I spoke with Ryder Carroll. He is a digital product designer living in New York City who designed the Bullet Journal, a part to-do list, part journal that can help you get organized and can help you accomplish your goals. You can find my full conversation with Ryder Carroll on iTunes, Google Play, Spotify, or Stitcher. It’s fair to say that the Bullet Journal system has become a global phenomenon, with countless users and productivity hackers raving about the Bullet Journal on Twitter. For someone that has struggled to reliably use productivity systems, I have sincerely found the Bullet Journal to be a useful way to track my tasks, organize my thoughts, and determine what is truly important. But you don’t have to use the Bullet Journal to learn from Ryder’s story and how we can get organized in our lives. While we talked about the origins of the Bullet Journal itself, Ryder and I also discussed touched on a variety of areas, including issues with other productivity systems and how the Bullet Journal can help if you’re thinking about taking a substantial career risk. In our conversation, Ryder spoke about how (and why) he developed the Bullet Journal. Essentially, he developed the Bullet Journal system to respond to a particular need — his ADD. While tinkering with productivity systems, he would discover various flaws, including the fact that most systems were unaccommodating. They would advertise themselves as the end all, be all of productivity systems, yet they would constantly fall short. In response, when developing the Bullet Journal, Ryder focused on making it modular and allowing him to design his own tools to plug into this modular framework. Simply put, the new system was working for him. It was designed to address his own challenges. But one day, Ryder bumped into a colleague who was planning her wedding. He noticed that her desk was full of Post-Its, scraps of paper, and notebooks. She was trying to get organized but she was feeling overwhelmed. Out of nowhere, Ryder offered to show her his notebook (which contained the origins of the Bullet Journal). He didn’t expect that she would say yes. Ultimately, Ryder nervously stumbled through an explanation of his system. And even when he would share the beginnings of the Bullet Journal with others, he would feel anxiety and fear. Ryder designed the Bullet Journal to address his challenges, and by sharing it with others, he made himself vulnerable to others. So how did he overcome this fear? He appealed to a higher objective. He saw that his system made a difference in somebody else’s life. While he still feels some insecurity about sharing the Bullet Journal, it is easier for him to enter those vulnerable waters if there is a high probability that his system will change someone’s life for the better. In order to achieve our goals, we will undoubtedly have to take some risk, which will cause us to be more vulnerable. This is true whether you’re an entrepreneur pitching a new product or an employee working on some new initiative for your company. While it may not totally eliminate the fear of “putting yourself out there,” concentrating on how you will be helping customers, colleagues, or someone else may make it easier to share. That said, there are other tactics to mastering fear, whether you are pitching a new idea or taking some major career risk. If you’d like to learn more, I suggest you listen to my interview with former Navy SEAL Brandon Webb, which you can find here. Many productivity systems are heavily based on technology. And don’t get me wrong: technology is obviously a great thing. We can access our to-do lists anywhere. We can easily organize our contacts and access our calendars on the go. However, sometimes there is too much of a good thing. Too much technology can be overwhelming. We’re connected nearly all day, from the moment we wake up to the moment we go to sleep. And even though many productivity systems contain a bevy of technological features, we often don’t use them. By contrast, the Bullet Journal is unique in that it is entirely analog. There’s no need to download a complicated app or sync your to-do list across multiple browsers or devices. All you need is a pen or pencil, a notebook, and your time. For a quick summary of what the Bullet Journal is, click below for a quick favorite tutorial, as narrated by Ryder. The analog nature of the Bullet Journal is special because of this unique idea of Migration. 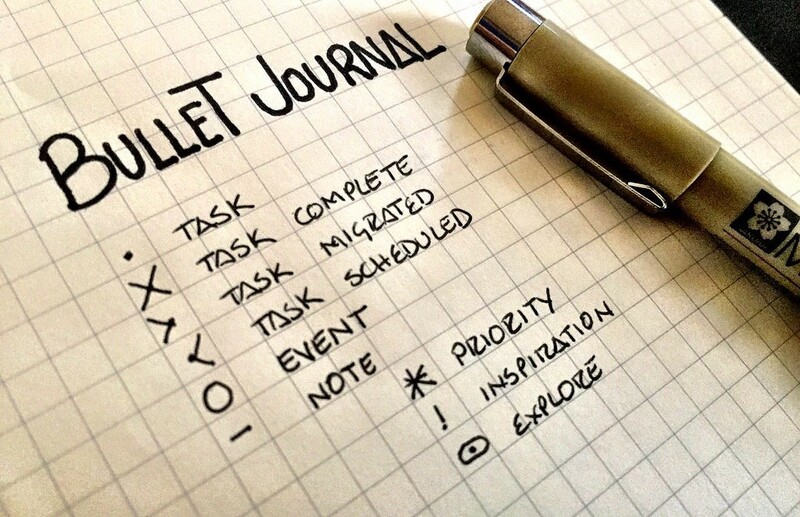 As part of the Bullet Journal system, users, at the end of every month, review the tasks and objectives that they did not accomplish that month. If the user finds the task important, he or she moves it to next month’s Monthly Log. If not, they don’t move the task forward. Through this process, you intuitively come to discover what goals are truly important. In other words, if you’re not willing to spend thirty seconds to one minute moving a goal from one page to another, how important is it really? It forces you to take some time and truly question why you are working toward a certain goal. This migration process is difficult to replicate with a purely electronic system, as advancing one goal is a simple copy and paste. Writing things down is a feature, not a bug, of the Bullet Journal. And by putting pen to paper, you actually remember more, as some studies have shown. So whether you use the Bullet Journal or some other productivity system, consider leveraging the power of pen and paper. In our day-to-day lives, it is easy to notice and react to the stress that we’re feeling. A presentation goes poorly and we feel discouraged about how our colleagues reacted. Our boss doesn’t give us a promotion and we cannot figure out why. Or a colleague is blunt and tells us that our work product is subpar. When these types of incidents occur, we normally focus on our feelings and reaction to the stress, rather than what caused the setback in the first place. And after focusing on our feelings, we typically move on and start putting out the next fire in our lives. In these circumstances, we need to slow down. Ray Dalio, the well-known hedge fund manager and founder of Bridgewater Associates, famously says “pain plus reflection equals progress.” Without reflection, we cannot make progress. Whether you use the Bullet Journal or not, Ryder recommends that we complete some introspection and reflection on a regular basis. Make it a habit and allocate time for it, whether it is every day or every two days. Instead of reflecting in your own head, write it down. Think about why something bad happened or why you didn’t perform to expectations. Be as objective as possible. And then from there, determine the steps that you can take to prevent such mistakes or missteps from happening again. Reflection without action isn’t good enough. Ultimately, experience is the best teacher. But by reflecting on your mistakes and taking swift action to correct future ones, you will be that much closer toward your ultimate goals. If we have big goals, we can sometimes feel overwhelmed. This is especially true if we want to take a major career risk, like leaving a secure job to start a business. Even though the end goal is exciting, the logistics can be scary. If you feel stuck when pursuing a goal — whether it’s due to fear or something else — Ryder recommends that you tread lightly. The larger the goal appears, the less likely you are to actually take the first step in pursuit of that goal. Because of this, Ryder recommends that we think about the smallest thing possible that we can do to move toward where we want to be. For instance, if you want to start a business, take any step today that gets you closer to that goal, whether that’s speaking with potential customers, doing market research for your particular niche, or even running a few Facebook or Google Ads to gauge interest. Your objective should be taking action — any action — that gets you closer to your goal, rather than simply thinking about the goal. Ryder also says that when pursuing our goals, we should be protective of our time. Obviously, we only have so many hours in the day. Those hours are often spent putting out fires or dealing with the most urgent tasks at the moment. Instead of reacting to the world, place firewalls on your calendar. For a certain period of time, you will be working on your side project — whatever it is. Keep in mind Parkinson’s Law and try to maximize your output in that blocked off period of time. Through observation and reflection, you will develop your own best practices going forward. The bottom line, however, is to simply get started. No matter how small, take substantive action toward your goal. Ryder developed an awesome system to help us get organized and work toward our goals. It is essentially a collection of Lego blocks that you can customize for own needs. Having said that, the Bullet Journal method may or may not work for you. The good news is that it doesn’t have to. Regardless of whether you use the Bullet Journal, we can learn from Ryder’s story. You can make great progress toward your goals. You can get closer to living the life you want to live. So what are you waiting for? Follow Ryder Carroll. Get started today. Thanks for reading! Once again, you can access Ryder’s interview on The Power Of Bold by visiting our page on iTunes, Google Play, Spotify, or Stitcher. If you’d like to read a full transcript of the episode, you can access the episode’s show notes here. Originally published at www.adampascarella.com on October 25, 2018.